Wow! 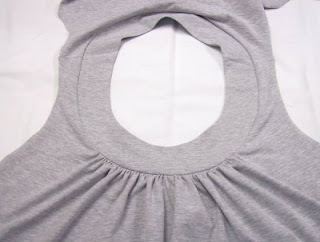 What great tops and thanks for adding the tutorial on the neckband! Love these tops Pam ! I love your versions of this top! 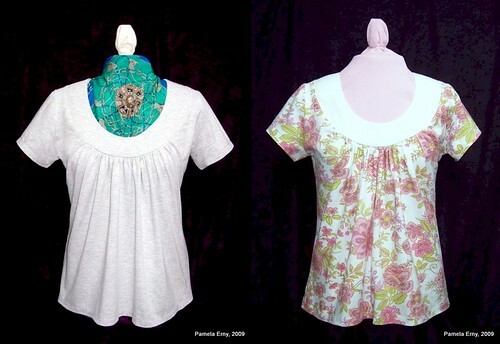 I love your two tops Pam, very nice style :-) The tutorial was very helpful. Great tops, thanks for the tutorial. Great tops, Pam. 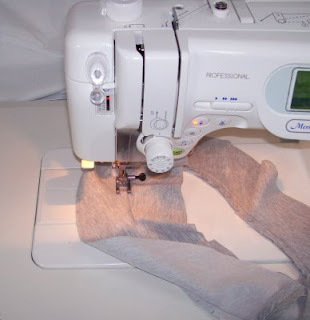 One question -- did you stitch or serge the neckband to the shirt? Another great Hot Pattern! Thank you for the tutorial. Those are beautiful Pam. Thanks for the great tutorial! Nice tutorial - you've broken it down so that it looks easy and manageable! Those tops look easy to wear and perfect for summer, too. I love these tops! This pattern has been a summer staple for me for several years. Thank you so much for sharing. I have a question on the depth of the scoop neck. Watching the Hot Patterns tutorial it looked like the top was quite low cut. How difficult would it be to raise the neckline? I have a shallow / hollow upper chest and small bust. Low cut is not for me. Thanks for sharing. I'm wondering how low cut the top is. Watching the Hot Patterns video clips it looked like the garment was fairly low cut. I'm thinking this would not be so easy to change. I have a shallow / hollow upper chest and small bust. Low cut is not very flattering for me. Kathy, on the second top I made (the one with the white collar), I made the band wider by adding about 1/2" to the INNER curve of the band to fill it in a little. The top as is, is not TOO low-cut, but I wanted the second top to be "Bend-Over in the Supermarket" safe, LOL! Very nice tops. I must look into getting this pattern. Thanks for the tutorial! Perfect summer top, thanks for sharing! If one has a fuller bust, do you think it would make sense to spread out the gathers in a wider arc so that some of the fullness would be over the bust? 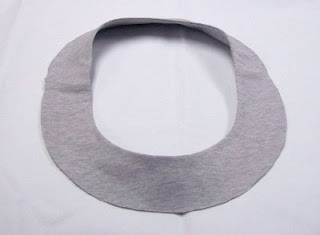 In other words, rather than concentrating the gathers toward the center of the neckband, what about spreading out the gathering notches to move some of the fullness toward the sides. I am thinking that more tradition FBAs, such as darts, wouldn't make sense with this design. Thanks for the great tutorial! 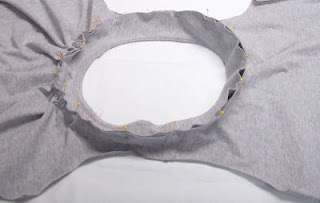 Yes, you can certainly spread out the gathers a little more along the neckband. Though I made one for a friend of mine who is quite large busted, and this top is like magic..it looks so good on her! You may want to watch the videos that I linked to in the post. Trudy, the designer of the pattern has a larger bust, and talks about how this style flatters both large and small busts. Thank you so much for your tutorial. I just made my first weekender T-shirt and it went together beautifully thanks to you. 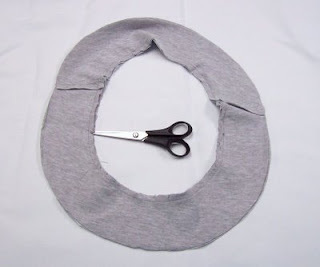 I also love your idea of making the neckband/yoke out of a different fabric. Okay Pam, now I'm nuts about yet another HP pattern. I absolutely *love* what you've done with the neckline band--deepening it to make it a little higher. I've been love with this look ever since I saw Nina Garcia's taupe-colored top with a bead encrusted neckline that she wore on Project Runway (a couple of seasons ago--it may have been sequined, don't remember for sure). Your alteration approaches that look, and for me really makes it 'pop'. 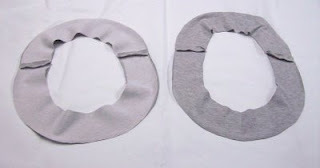 Nina's top's neckband shape was actually more like McCall's 5659 which was deeper yet, but that little bit that you've done for the sunshine top is just great! Your gray version (another post) was so appealing, I ordered the pattern. But this pattern, like others I've gotten from Hot Patterns, has one very frustrating aspect: no notches! The instructions refer to various notches; even your tutorial refers to notches. But there aren't any on the pattern pieces. I saw that pattern on hotpatterns.com and thought it would be a great staple for my wardrobe - I love what you've done and thanks for posting the pictures and instructions! I'm a new sewer but I have a class coming up on knits so I think the Sunshine Top will be my first project - I'll surely refer back to this post, thanks again! Thank you for writing this tutorial! I remember reading it when you wrote it last year and I filed it away (mentally) for when I needed it. Well, tonight I was puzzling over the pattern instructions and my brain was blocked. I stopped and looked online I found your tutorial! I'm assembling everything right now. Thanks! 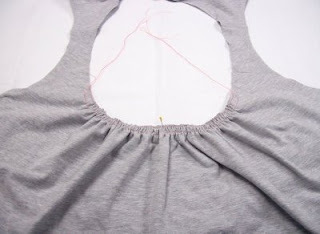 Dear Pam, Many thanks for the tutorial on the neckline of the Weekender Sunshine Top. It made it look so easy that I immediately jumped on it and without even consulting the pattern instructions, made my first top....straight out of the envelope because I wanted to see how the fit was and analyse if adjustments were needed. Well, they were needed in the form of a full bust adjustment. I did what I would now describe as a partial adjustment....just opening the front in 2 places and made a second top. The fit was a little bit better but not much. Now I am on to the third top and have once again chopped the pattern up and redone the fba. I am still not pleased with the top. I now have less gathering of fabric obove the bust/under the arm. It is still not what I would like it to be. My question....would you please list the steps you took for your fba, or even a few pictures would be very helpful. I will take it from there, my third piece of knit is already hanging from the back of a chair. Would appreciate any assistance you are able to give. Thank you.